In a short but controlled trial of beverages and weight loss, diet soda linked to slightly greater loss compared to other beverages, according to a new study published in the journal Obesity. The study adds to the limited, but growing body of human research on diet beverages. With obesity being a cause of eight cancers, understanding how our food and beverages affect weight gain or loss is important to cancer prevention. For the trial, one-half of the 300 overweight participants were instructed to drink at least 24 ounces of water daily and not to consume any diet beverages. The other half were told to drink at least 24 ounces of diet drinks, but they could also drink water. All participants also attended weekly group meetings as part of their behavioral weight loss program, to help with weight loss strategies, including learning about portion sizes, self-monitoring and physical activity. They all received the same information, except for instructions on drinking water or diet drinks. After 12 weeks, those consuming the diet beverages lost more weight than the group consuming water. The difference was small, but significant, with the diet drink group losing an average of 13 pounds and the water group, 9 pounds. Although it isn’t clear why the diet drink group would lose more weight than the water group, one finding that could be a factor was that the water group reported more hunger than the diet beverage group. The authors note too, that all participants came into the study drinking diet beverages, so the water group had to make the greatest behavior change – switching from diet drinks to water. This 12-week study was part of a larger 1-year trial also looking at weight loss maintenance. At the end of the year, researchers will determine how successful participants were at keeping the lost weight off. 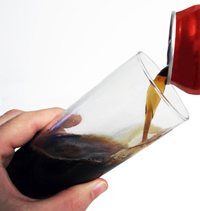 AICR recommends avoiding sugary sodas and drinks as they link to weight gain, overweight and obesity. This study was funded by the American Beverage Association. Two authors, John C Peters and James O Hill received consulting fees from the Coca-Cola Company outside of the submitted work. Source: Peters JC et al. "The effects of water and non-nutritive sweetened beverages on weight loss during a 12-week weight loss treatment program." Obesity. 2014 Jun;22(6):1415-21.